The National Historical Publishing Company was established on 1 Feb 1988. The primary objective was to publish library quality books based on material located in the National Archives in Washington, DC. These books were published to make genealogical or historical research of the records much quicker, easier and less expensive than by visiting the archives in person. The data within the introduction of each of the books explains how to order the necessary forms to allow an individual to purchase copies of specific records by mail using the information provided in the entries. All of the books are printed on acid free paper with extremely good quality buckram covers and are offered to the public at a considerable savings over the purchase price of the records on microfilm. 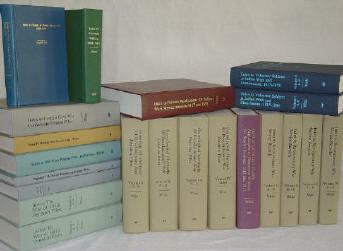 The books are in an index format or are furnished with a complete full name index at the end of a book or set of books. Some of books in the index format will contain a cross-reference index to those persons other than the claimant or recipient mentioned in the body of the main index. Each of these books were assigned an ISBN (International Standard Book Numbering) number as well a LCC (Library of Congress Catalog Card) number and are covered by copyright. TENNESSEE SALES TAX EXEMPT FOUNDATIONS such as Libraries, Historical or Genealogical Societies, Institutions, Churches, etc., we must have a signed copy of your Tax Exempt Certificate on file if you are to receive the Tennessee Sales Tax Exemption. You can fax or mail a signed copy to us using the address or fax number provided near the top of this page.